The sub hiking of Chukung and Gore sheep would make you prepared for the trek to Everest Base Camp and Kalapathar. The steep and snowy terrain could be tricky but the experienced guides of Backpacker Team would make your trek risk free. The panoramic views of snowcapped mountains and jaw-dropping scenes of sky meeting the tip of Himalayas up in the horizon make you feel as if you are in the land up above the clouds. This part of the trekking in Everest region allows you to take the closer look at the Mount Everest. The time spent on the base camp would give you the chance to interact with those who conquered the mighty Everest. The tantalizing tales of their heroic attempts and your journey up to the lap of Himalayas could be your unforgettable life tale. 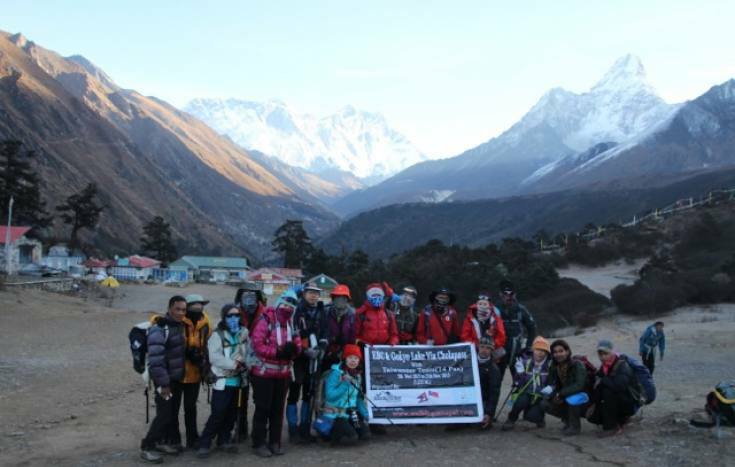 Just book a trek to Everest with us!!! We bet you that when you return to your homeland you will miss our hospitality, friendship and above all the majestically naturally Nepal, once is not enough. So, for your vacation in Nepal during your holidays, book a trip with us. You won’t regret. The great Nepalese Himalayas and Sherpa Community are waiting to have your gracious presence. Day 02Fly Kathmandu to Lukla & trek to Phakding. (2620m) Early morning Fly to Lukla(2810m.)30min. The Lukla airport often called as Tenzing Hillary Airport is the world’s most dangerous airport. The thrill of landing in such an airport is an added experience to make. From Lukla the Trek begin to Phakding. Phakding is a small village in the Khumbu region of Nepal. It lies in the Dudh Kosi river valley just north of Lukla and south of Monjo, at an altitude of 2,610 m. In this part of the trek we reach to Jorsalle which is the entry point of the Sagarmatha National Park where entry permit will be checked. Day 03Trek to Namche (3445m). Namche is a village and Village Development Committee (Namche) in Solukhumbu District in the Sagarmatha Zone of north-eastern Nepal. It is located within the Khumbu area at 3,440 metres (11,286 ft) at its low point, populating the sides of a hill. Namche is the main trading center and tourist hub for the Khumbu region with many Nepalese officials, a police check, post and a bank. It is also the place for acclimatizing for the trekkers to go further towards base camp. Day 04Acclimatization day in Namche Bazaar. The acclimatization process takes place in Namchebazar by taking short day hiking or relaxing by roaming around in the Namche itself. According to health experts, the trekkers should always move while relaxing and acclimatizing to the altitude. So, we take our fellow trekkers to either short hiking or walking in and around Namche before setting up for the further trek. Trekkers can hike to the world’s highest placed hotel “The Everest View hotel” from where you can see the spectacular view of the Mount Everest, Ama Dablam, Thamserku, Khangtega and other panoramic views of snow capped mountains. The Khangtega mountain is unique to its geographical setting as it resembles the back pack of Horse riding. Day 05Trek to Tengboche (4245m). After getting acclimatized we set off to Tyangbouche early morning after breakfast. The trail towards Tyangbouche is less smooth but it contemplates the trekkers with the majestic views of Mount Everest up close along with Mount Ama Dablam. The ups and downs in the trail give our soul and body the ultimate challenge. The serene smell of pine forests and swift white river beside the trail makes the trekking tiredness to vanish. We will have the lunch on the way. Day 06Trek to Dingboche (4362m). Dingboche is a village in the Khumbu region of eastern Nepal. Situated at an altitude of about 4,362 m (14,340 ft), above the Tsola River, Dingboche is a popular stop for trekkers and climbers.Dingboche was primarily a farming village raising potatoes and buckwheat, and keeping yaks. It is the important stop over for acclimatization too. Day 07Acclimatization day in Dingboche. The acclimatization process takes place in chukkung Valley from where you can see the spectacular view of the Mount Makalu, Barunste,Ama Dablam,world most popular island peak, Thamserku, Khangtega and other panoramic views of snow capped mountains. Day 08Trek to Lobuche (4575m). Upon this juncture, our trail starts to step higher up in the mountains slowing leaving behind the Khumbu glacier. On the way, we will see the memorials of many mountaineers who died while trying to conquer the mount, Everest. The cemetery marks the memorial of the famous climber like Scott Fisher, Rob Hall and other climbers. The air starts to become thinner from here onwards as we pass the Pumori, Khumbu Tse, mahalangur Himal(mountain) along with the Nuptse smiling on our right. Day 09Trek to Gorakshep (5165m)/ EBC/ Gorakshep. From lubuche to Gorakshep we start to see the north ridge of Everest along with Mt. Pumori, Mt. Mahalangur, Mt. Lingtern, Mt. Khumbutse, Mt. Nuptse, etc. Little walk down would take us to Thangma Riju from where we can have the glory of 360 degree sight of snowy mountains. Climbing steeply up to the top through the torrent of Changri Glacier, we catch our first glimpse of Kala Patthar, a grey-green knoll beneath the Mt. Pumori. As we reach Gorak Shep, we will find snow-capped mountains looming all around us including the top of the world - Mt. Everest. After a brief lunch and rest, we take the trail to Everest Base Camp through the once vast Gorak Shep Lake. Upon arriving here we will be greeted with the lots of colorful tents of people vying to conquer the Mt. Everest. At this very juncture we can feel relaxed that we have achieved our ultimate goal. Day 10Trek to Dzongla The best place to snap pictures of the panoramic view of snow capped mountains. The Kalapatthar gives you the lifetime opportunity to witness kissing of morning sun rays at the tip of several mountains including the Mt. Everest. All our tiredness and the hardship would vanish with the majestic scenery that you can see from here. You will feel as if the heaven and earth are actually connected right here. These moments are the most precious part of this trekking. Once you get back to your normal setting the memory of these panoramic views would always motivate you. Day 11 Trek to Dragnak/Thangna (4700m) via crossing Cho La pass (5420m)We start the day by means of mountain climbing to Chola-la. crossing over and descending over again to Thanga. Day 12Trek to Gokyo lakes (4790m)We trek to Gokyo Lake crossing over Ngozumpa Glacier (the massive glacier inside the Himalayan 36 Kilometers in period). Gokyo village stands by using the third lake and Cho-Oyu Mountain as a backdrop sets a tremendous remarkable sight at this juncture. After lunch, you may explore across the Lake, Dudh Pokhari. Day 13 Hiking to Gokyo RI (5483m) and trek to Dole (4200m) Gokyo Ri is the highlight of this trip. Early morning, we hike as much as the Gokyo Ri (Gokyo top). hiking to Gokyo Ri is glaringly strenuous as it's miles steep up and takes approximately three to four hours to attain the pinnacle. but even from the trial surroundings of Gokyo village on the brink of 0.33 lake neglected by Cholatse and the broad Ngozumpa Glacier are thoughts blowing. We sense like we're surrounded by means of panoramic mountains like Kusum Kanguru, Thamserku, k 43, Kangtega, Taboche, Cholatse, Makalu, Lhotse, Nuptse, Everest, Changtse, and Pumori. Sight of sunrays kissing the Everest that towers over all surrounding peaks is not like from Kalapattar (from Kalapattar Nuptse appears taller). Our Gokyo Ri go to may be unforgettable life time memories. We trek down to Gokyo. Upon breakfast we trek to down to Dole. Day 14Trek to Namche (3440m)Descend to Phorste Tenga (3680m/1270ft) and complete steep climb to Mong- la Danda (4940m/16200ft), once more we descend to Kyangjuma (3550m/11645ft) then less difficult path to Namche. Day 15Trek to Lukla.The last day of trekking. At this juncture we will have fun while trekking with some songs on popular nepali folk tunes, we will share the pictures that we took and the memories that we cherished. Upon reaching Lukla we will give rest to our mind and body. Day 16Fly back Lukla to Kathmandu.We head back to Kathmandu and as earlier the accommodation will be provided along with the breakfast in a three-star hotel in Kathmandu. On a spare day, you can roam around Thamel or other major touristic areas at Kathmandu and do some shopping and dinner at Nepali typical Resturant with cultural program.